A re-fight of the Battle of Albuera at Matt's using the 'In The Grand Manner' rules. This was one of the bloodiest battles that the British ever fought in. Not much of a turn out at the club this week, probably people too stuffed up from Xmas, so broke out the Munchkin along with a couple of the Christmas themed expansions. Reverted back to basic set and first expansion along with Waiting For Santa and Santa's Revenge. These games were, once more, over surprisingly quickly given the number of players as seems people are more willing to help each other within the game a lot more. This was possibly the consequence of having more players than the recommended six maximum as there are not enough monster 'buffs' to counteract the additional 'help' factor. 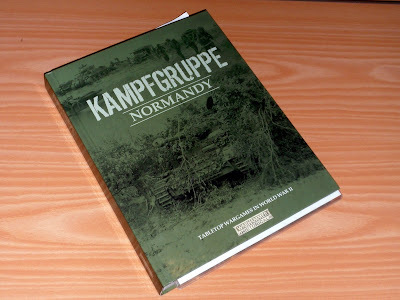 A run through of the Warhammer Historical Kampfgruppe Normandy WW2 game. Allied troops advancing upon a village being defended by German Paratroopers. Strange to play a 'Warhammer' game without the classic stat-lines. Like a lot of recent 'modern era' games it makes use of the idea of suppression of troops being just as important as killing them. The campaign comes to an end as it normally does... with an all out brawl for the crown. Each player was to command his own personal 12 point retinues they meet on the fields outside of Altdorf. Who will dominate, the insurgents or the Emperor and his 'loyal' supporters?